Seniors with limited mobility need accessible storage options. Independence is often important to clients of senior care services. However, individuals with limited mobility may find this more challenging as it's harder to move around and complete daily tasks. Keep things low: Reaching for items that are high in a cabinet or on a shelf can be problematic for clients with limited mobility, especially if they are in a wheelchair. 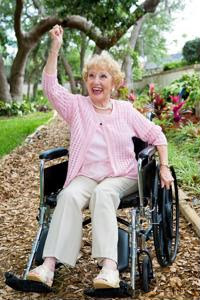 It can also be more dangerous as reaching can affect balance, which may put a senior at risk of falling. Use more shelving: Instead of lots of cabinets, using shelving for storage is a better option. It's much easier to grab items off of a shelf, whether it's dishes for dinner or a book. Open shelving removes the need to open doors or pull out drawers, which can be problematic. Rearrange the fridge: Your clients will need to feed themselves when you're not there, so you can help them rearrange their refrigerators so that their favorite foods are easily accessible. Their favorite snacks, meal items and drinks should be front and center.